Mike Clark the club secretary gave up his time over a number of months to introduce youngsters from the HELP project to the great game of golf. The youngsters were shown the basics of golf chipping, putting, and driving the golf ball not forgetting the etiquette and some rules of the game. By all accounts a great time was had by all. The HELP project kindly donated £750 to the golf club, which enabled IGC to purchase a valuable piece of equipment which will be used to feed and improve the fairways. This is a great example of the community working together to their mutual benefit. Club Captain Gordon Miller and greens convener Billy McLaughlin thanked Mike for his hard work and the HELP project for enabling the club to purchase this much-needed piece of equipment. 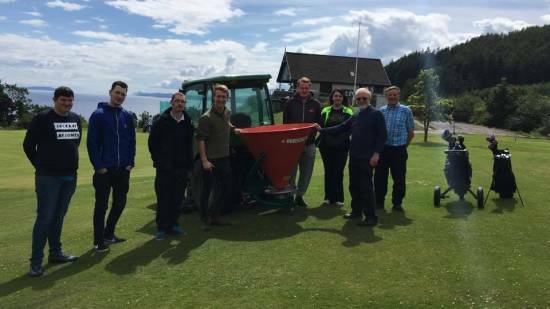 Pictured are Mike Clark, Neil Kelly HELP activities co-ordinator (with their hands on the spreader) and Billy Mclaughlin far right.